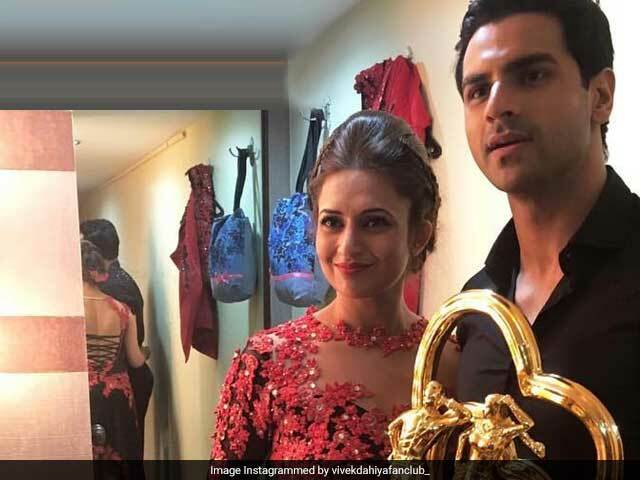 Star couple Divyanka Tripathi and Vivek Dahiya wrapped Nach Baliye 8 with the winning trophy on Sunday night. Apart from the trophy, Divyanka Tripathi and Vivek Dahiya also took home cash prize of Rs 35 lakhs along with a Hero Maestro and jewellery by Orra. Divyanka and Vivek left behind the other finalists - Sanaya Irani and Mohit Sehgal, and Abigail Pande and Sanam Johar, to score the winning trophy. Abigail and Sanam took the second spot while Sanaya and Mohit secured the third position. Divyanka and Vivek, popularly addressed as 'DiVek' by fans, were one of the strongest contenders of the dance reality show from the beginning. Meanwhile, this is how the couple celebrated their win with fans and followers. The finale of Nach Baliye 8 was made extra special with the presence of Ranbir Kapoor, who had a fun-filled evening with the contestants while promoting his upcoming movie Jagga Jasoos. The Nach Baliye 8 finalists were also joined by previous winners Jay Bhanushali and Mahii Vij and Sanjeeda Sheikh and Aamir Ali, who delivered blockbuster performances. The judges' panel comprising Sonakshi Sinha, director Mohit Suri and choreographer Terence Lewis also cheered for the winners. Nach Baliye 8 had kicked off in April with 10 celebrity couples participating. Over the episodes, the finalists beat out the list of participants comprising Ashka Goradia and Brent Goble, Dipika Kakar and Shoaib Ibrahim; Monalisa and Vikrant Singh Rajpoot; Bharti Singh and Harsh Limbachiyaa, and Pritam Singh and Amanjjot Singh, to reach the finale. Meanwhile, Divyanka Tripathi and Vivek Dahiya are all set to celebrate their first wedding anniversary on July 8 and will reportedly fly to Europe for a vacation.